Paneer Manchurian is actually means cottage cheese in hot and sour gravy. 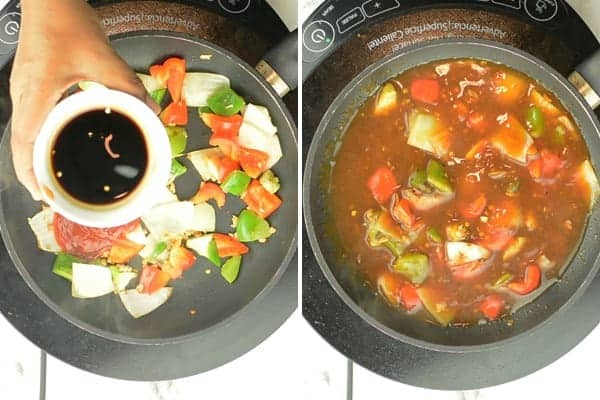 This is a popular fusion recipe in India made using Chinese cooking method. A healthy food and you won’t be sad to eat. An easy weeknight dinner. Perfect to go with any dish. Can be served as an appetizer or as a side dish. Definitely not a guilty food which has all the goodness of milk. Have you ever tried a Chinese recipe which is called the influence of India? How you ever tried a Chinese food recipe which is most popular in the South Asian countries like India and Pakistan? 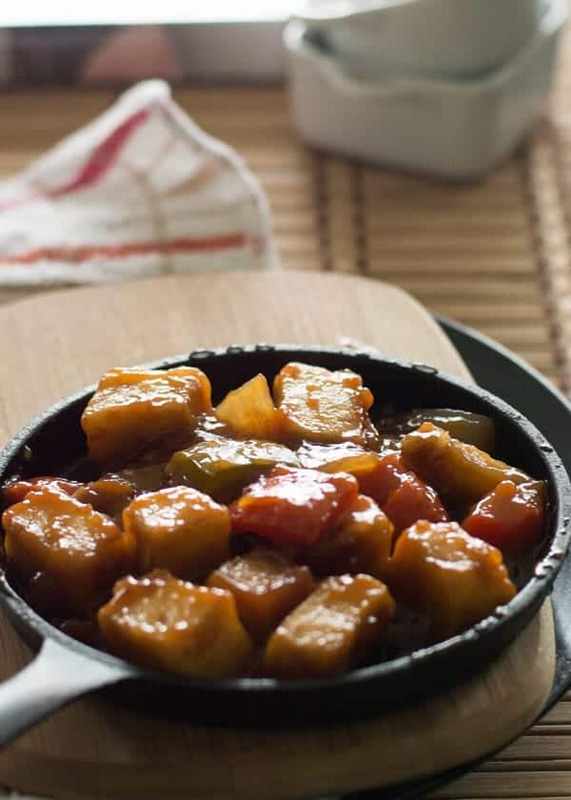 Then you should definitely try this Paneer Manchurian. This is one of the most popular vegetarian recipe in India. Made with cottage cheese pepper green pepper and soy sauce. But it is still skinny compare to that of any cheesy dishes. Ready-made mixes may also available in your local Indian store. But you can make your own Paneer Manchurian to have a great leverage of adjusting the ingredients according to your own preferences. I would definitely advise you to make the sauce at home rather than getting it from the stores. It is a simple task that you could make within 5 minutes of time. If all the ingredients are kept ready, you can make this paneer manchurian within 10 minutes. The best way to surprise the guests or the lazy dinners. Not necessary that you need to sweat a lot or to be in the kitchen for a long long time to make it exotic exotic dish. The main factors required to make exotic dish is to have the right recipe and the correct planning. Planning before cooking makes cooking as pleasant experience in the kitchen. Are you interested in looking into other Indo-Chinese recipes? It is totally irrelevant to suffer yourself to make your family happy for the food. All you need to be smarter and wiser than the hard worker. And still make your family and guests happy. And this Paneer Manchurian such a recipe all these introductory lines of perfectly matches. I bet you if you make it once you will also accept these words I say here. Furthermore, you know I’m the person who wants to spend least time in the kitchen. And this is the most Wanted item in our household. As this is a tasty dish for my son and an effortless dish for myself. To make this recipe all you need to have handy with the ingredients like, the cottage cheese / paneer, soy sauce, sriracha sauce, cornstarch, green peppers and onion. Cottage cheese / paneer: Paneer is the homemade cottage cheese, which is very popular in India. It’s easy to make it home with vinegar. Or alternatively you can also get them in your nearby Indian stores in the Frozen isle. If Indian stores are not accessible to you you can to make your own cottage cheese at home by cuddling the milk with vinegar. Straining them for 2 to 3 hours in a cheese cloth. And cut them into cubes. There are multiple videos available online for how to make paneer at home. I will also, soon come up with the recipe for making. Soy sauce: It is not an International Ingredient anymore. Nowadays it is available in almost all the leading grocery stores in United States. Sriracha Sauce: Same as soy sauce, sriracha sauce may now available in your nearby grocery stores. 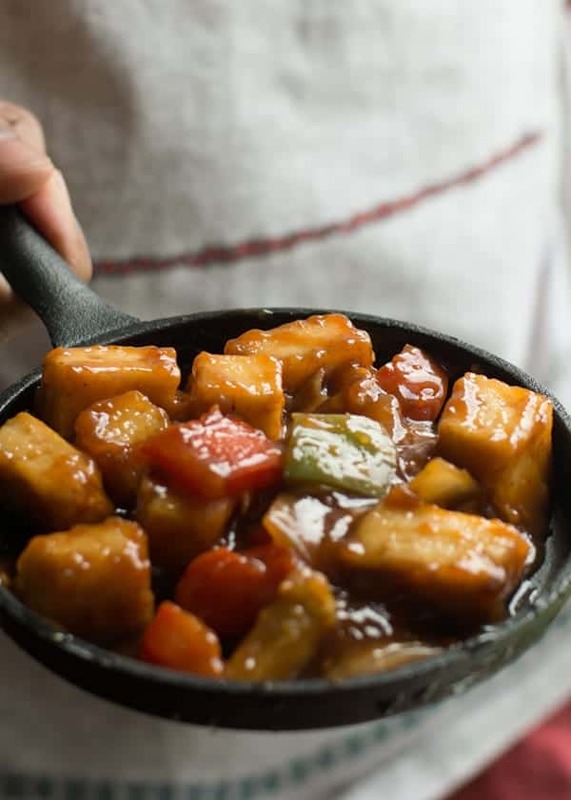 The other ingredients for Paneer manchurian are very generic and may available in most out pantry..
Manchuria is a state of Northeast China where it is known for its spicy dishes. but I did not know the origin or story behind manchurian recipe. I also did not even know how this is authentically made or prepared in the Chinese States. But this is how manchurian is made and served in India. A very popular dish among the vegetarians in the country. This is a Indian style Chinese recipe which is famous for more than half a century in India. Now it is gaining popularity slowly around the world. Paneer is a Hindi word which refers to the homemade cottage cheese. This is a fusion recipe between than Indian ingredient ‘Paneer’ made in Chinese style cooking. This is a vegetarian and high protein dish good for all ages. 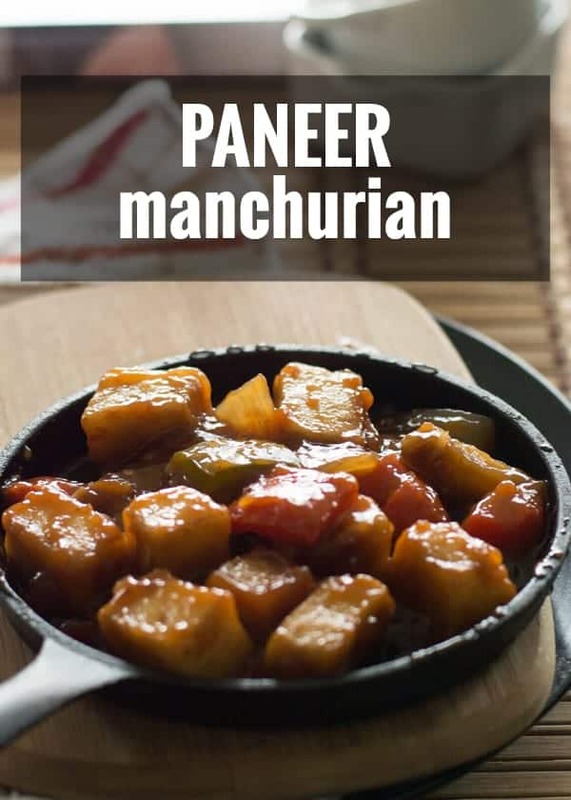 How does paneer Manchurian taste like? This dish taste like a cheese ball in a sweet and sour gravy. If you have tried any hibachi food or Chinese food before you could definitely understand how the does taste like. The sauce does have a sharp taste of soy sauce and the sharp taste of sriracha sauce with flavors of green pepper. The sauces tastes extremely good with paneer. What main course to pair with? Paneer Manchurian is best to serve with Indian flat breads like, roti, naan, chapati or fried rice or steamed rice or noodles. There are many variations can be made for paneer manchurian recipe by adding different ingredients. Each additional ingredient really brings out the whole new flavor in the dish. You may add chopped ginger which brings out the wholesome tropical flavor. You may also add a combination of green pepper, yellow pepper and red peppers. These three peppers together makes the dish look exotic and vibrant. Makes it worth to serve for a party or for a large crowd. In addition, this is so easy recipe that just satisfies the entire crowd. A small amount of cornstarch will do thicken the gravy than you expect so just add one teaspoon of cornstarch and wait to see the results that how it does turns into. Then you may add more diluted cornstarch to thicken the gravy. You may add shallow fried paneer. By this the paneer becomes firm and crisp and which makes it more tasty. I always like to add that shallow fried paneer than the fresh ones. The Indian store also carries fried paneer and as well as fresh paneer. If you’re planning to make it for parties, make the gravy ahead. And and add the paneer just before setting the table. This way you may not ended up in soggy Paneer. You made refrigerate the leftovers for 4 to 5 days. I advise you to reheat a over stove top and than the microwave. The microwave may cause the paneer to become stiff and rubbery. In a pan add two tablespoon of cooking oil followed by a teaspoon of minced garlic. Saute until it becomes golden brown. Then add diced red pepper, green pepper and onion. Remove the layers of onion before adding. Then add soy sauce, sriracha sauce, tomato ketchup, brown sugar and diluted corn starch. Bring it to boil. 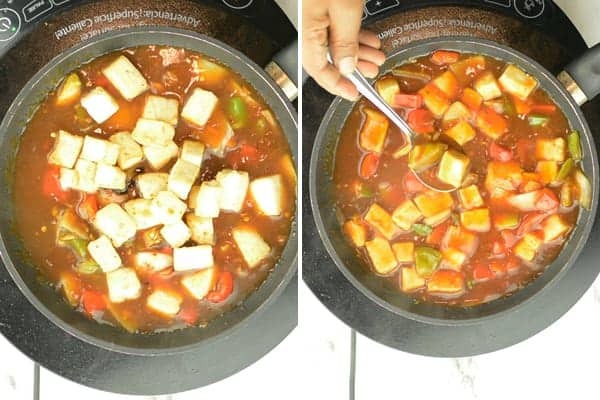 Then add paneer cubes and cook until it reaches desired consistency. Serve paneer manchurian hot with bread, rice or noodles. Paneer Manchurian is actually means cottage cheese in hot and sour gravy. 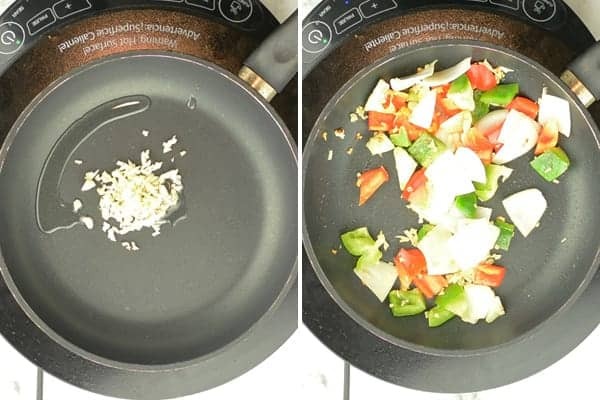 This is a popular fusion recipe in India made using Chinese cooking method. Dilute 1 tbsp of cornstarch with 1/2 cup of water and keep aside. In a pan, add cooking oil and minced garlic. Saute until it becomes golden brown. Now add diced green pepper, red pepper, onion and saute in medium flame cook. Then add soy sauce, sriracha sauce, tomato ketchup, brown sugar and diluted corn starch. Bring it to boil Then add paneer cubes. Simmer for a couple of minutes until it reaches to the desired consistency. What a fascinating fusion. I love paneer dishes, but we don’t find it here locally. Do you think halloumi cheese would work? I think I’ll cut the soy down as the halloumi is saltier than paneer (I think). I have not used hallouumi cheese before. That is the great question. After a small research, I found that halloumi cheese is similar to paneer retains its shape even after cooking. Online fellow bloggers also suggest that halloumi cheese is the closest substitute for paneer. Do try substituting and let us know how it turns out. Thanks Ron for asking.